The devil makes work for idle hands...Honestly! K100-forum.com » General discussion » The devil makes work for idle hands...Honestly! 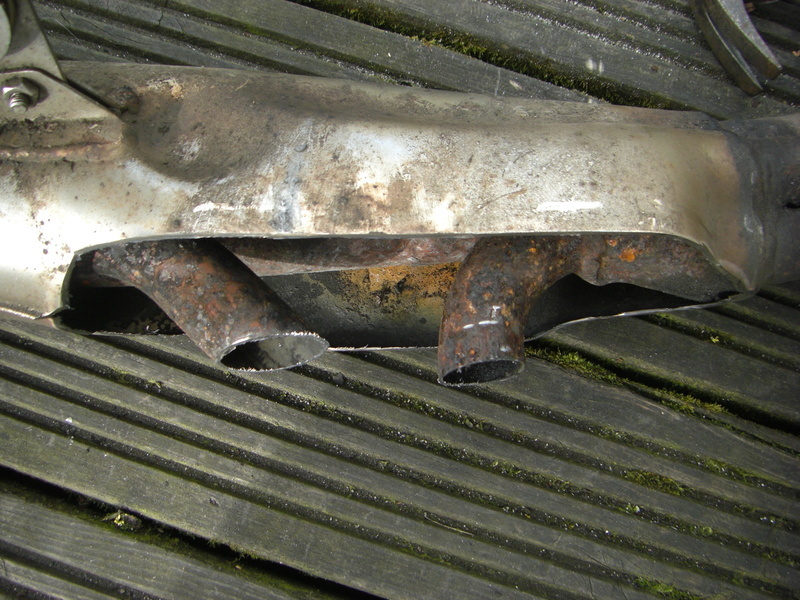 Have you ever wondered what's inside that bulge in the centre section of a 16v K exhaust? I have. I bought a large proportion of a K1100RS last week from Devon to help me get all my spare K parts into/onto one bike-more of this project later...at least the wife bought that story anyway. 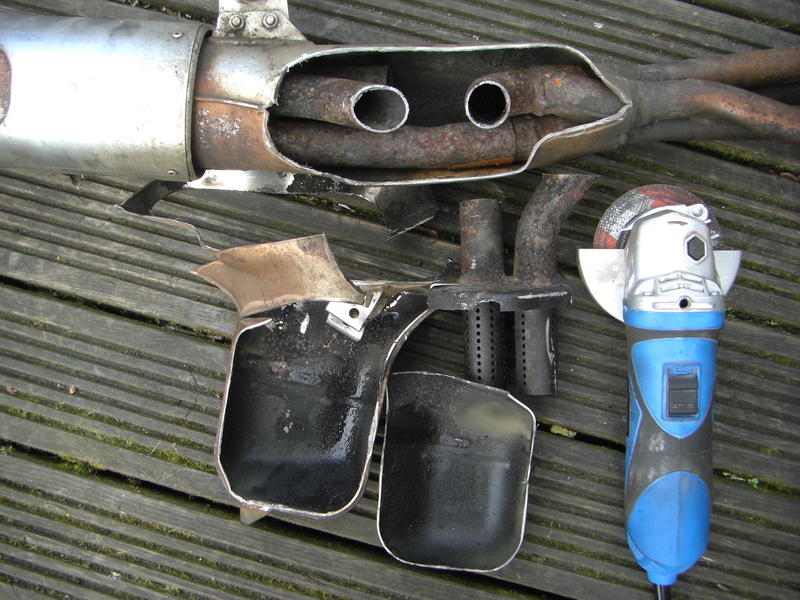 Once I'd got the exhaust off the engine I thought I'd investigate the innards because I had an idle hour on my hands. Weirdly the branch that mates 1 & 4 doesn't mate into a continuous pipe like 2 & 3. It turns into the bulge under the gearbox, into it's own chamber then onward into the silencer. All the gasses go up into the silencer then back down into this chamber where they exit out through the open ended pipe at the back. The exercise for me will be to join the two pipes I've cut, shorten the outlet pipe and I'll then weld a plate over the side. I should sound nice but look stock. 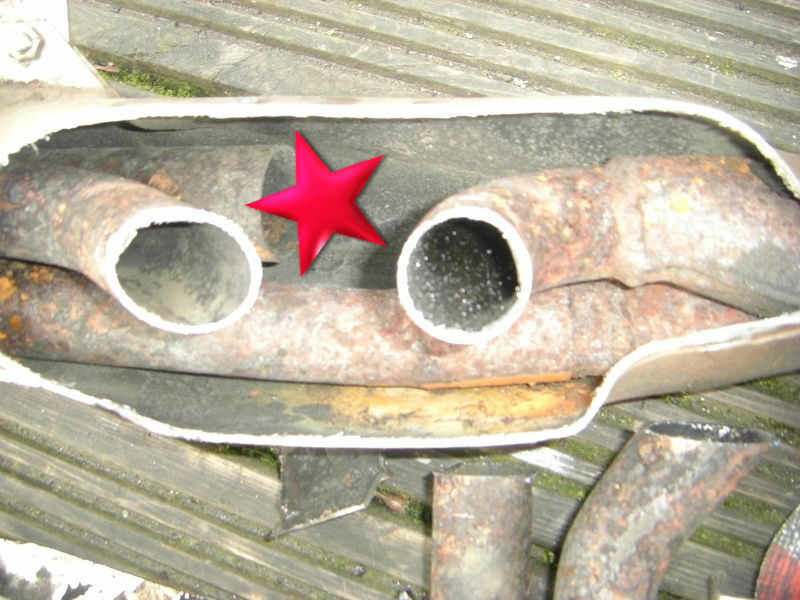 Was anything connected to the pipe marked with a star ? No. The gasses come back down into this chamber from the silencer and exit out through that pipe. I looked into the end of the silencer and you can see straight down to the other end of the "star" pipe. I hope this crude diagram shows the flow paths a little better. @Motorbike Mike wrote: should sound nice but look stock. Thanks Mike - you've confirmed what I've long suspected in that the colostomy bag was nothing more than a damping chamber. That's an interesting way of tidying the bike shed.....food for thought........I am looking at enough stuff in my shed that needs tidying to make 2 non running Ks into one running LT too. Even have colour matched bits thanks to Will. Only thing needed would be a tank, tyres, time and tinkling. But that would mean parking the RT instead of riding it. Only thing needed would be a tank tyres time and tinkling. But that would mean parking the RT instead of riding it. Olaf why would you fit tank tyres to your bike? Don't tell me that you now have 8 sets of panniers fitted and the standard tyres can't cope with the weight. Now that you mention it I do seem to have quite a few panniers.....and they aren't all little black numbers.